I don′t fish myself, but as a biologist with a close friend who is quite a good ichthyologist and keen fisherman, I feel qualified to say a few things about fishing in Austria. Firstly, the country makes a great place for fishing: Plenty of lakes that are part of scenic landscapes, ponds and rivers provide a variety of fishing opportunities. Highlights are clearly the mighty Danube, the lakes of the Salzkammergut, Salzburg and those of Carinthia, rivers and creeks in Styria and Lower Austria, Lake Constance (Bodensee) in Vorarlberg and Lake Neusiedlersee in the Burgenland. Both fly-fishing and "classic" fishing are done in Austria. In terms of fish, there are approximately 74 species native in Austria, although 15 of them were recently introduced and calling them "native" is controversial. They face some 200,000 fishermen and -women, mostly in Lower Austria (due to the high population density in the region of Vienna/Lower Austria). 43 species of fish are endangered (some only in Austria, others in general) and protected. A total of 1,000 tons of fish are caught in Austria every year. 520 tons by hobby fishermen, 480 tons by the relatively few professional fishermen. Fish is an ingredient in traditional cuisine is particularly important in the Salzkammergut, Salzburg and Carinthia as well as anywhere by the Danube. 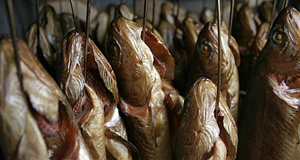 Fish is often smoked in Austria, sometimes marinated or used for aspics. Particularly attractive species of fish include pikes, various species of trout, and sheatfish. The latter one can grow especially large. Fly-fishers are usually after graylings. Fisheries is individually regulated by the federal provinces, just like hunting. Therefore, the laws controlling fisheries differ quite a bit within Austria. Laws for the prevention of cruelty against animals were recently transformed into national ones, and does therefore apply to fishermen in all of Austria. To go fishing in Austria, you require a fishing card as well as the permission by the owner or landlord of a lake or river. Generally, big rivers and lakes belong to the public and it is relatively easy to get hold of a fishing card for these - just ask the local tourist information about the office issuing fishing cards ("Fischereilizenz") in a certain area. There you have to pay a fee, usually for individual days or weeks. One offer especially for tourists is the "fishing card" (literally called that way in German to make it sound more modern and cosmopolitan). This "fishing card" is issued by the Österreichische Bundesforste (National Forest Administration), comes with extensive fishing permissions and all sorts of information material. You can register, pay and book a fishing day in a certain area online. At the time of writing, all these convenient services are available only in German, though. With privately owned or rented waters, you have to find an agreement with the landlord. There are several fishing holidays operators in Austria. They have specialised in fishing and usually offer packages including all permissions, sometimes equipment and supplementary items such as guides, maps and determination keys for local species of fish. You have to pay for this service - the cheapest option is clearly to bring your own gear, get a fishing card and head off to a lake by yourself. Having a professional to advise you might be more convenient and relaxing, though.